Tomatoes are in season and they don’t need anything more than a sprinkling of sea salt, but if you’re looking for another way of celebrating the many varieties with their complex flavors, give this BLT Panzanella a try. 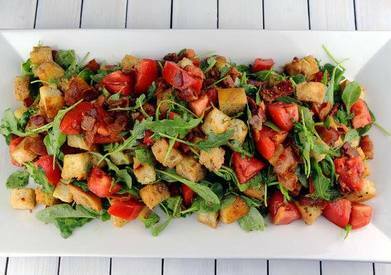 The salty and crunchy Bacon, peppery arugula, crispy Bacon-fat-coated croutons and zesty shallot vinaigrette offer a bed of summery goodness for wedges of the brightly colored fruit. This family-sized recipe is great for your next cookout, or if you want to enjoy the salad as a light lunch over several days, simply keep the croutons separate from the rest of the salad and toss them in right before eating.